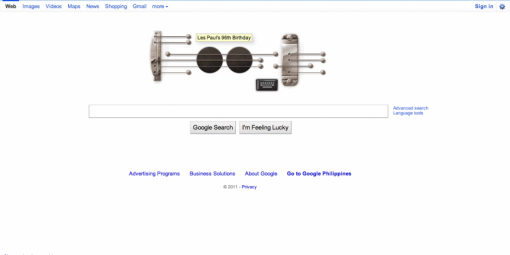 Les Paul Google Doodle – Cool BUT Costly! So last week, how much time did you spend playing with the Les Paul Google Doodle? Arguably, that Doodle is the second best that Google has come up with. I personally prefer the Pac-Man Doodle although it seemed to me that more people voiced out their appreciation of the more recent Doodle. And it also seems that more people spent time actually staying on Google’s home page – not to do anything else but play with the virtual guitar and record their handiwork! According to ExtremeTech ((ExtremeTech)), the “simple” Doodle cost the world a whopping 10.7 million man hours. Imagine countless people stopping work to play their favorite tune using the Doodle. Imagine the same people conducting searches to find out which strings to “pluck” in order to get their desired tone. It’s easy to understand just how many hours were spent playing on the guitar all over the world. Now let’s talk money. Those 10.7 million man hours – how much does that cost? Working on the assumption that the average Google user earns $25 per hour, those hours translate to $268 million. Oh please don’t let the executives read these figures or they just might ban Google. Then again, who is to say that those executives didn’t spend their fair share of time on the Les Paul? And speaking of money, the Doodle didn’t come free for Google. The guys at ExtremeTech seem to love doing math, so they went ahead and calculated the cost of the Les Paul Doodle – a mere $15,000. Well, it’s not a small sum but comparing it to the cost in productivity, it’s a drop in the bucket. Google, you may be a productivity killer at times, but you still rock!